An International Certificate of Competence will allow you to bareboat charter – why not do it in the sun! We offer an International Certificate of Competence, a structured sailing course, developed by the IYT, accepted for bareboat charter worldwide in Croatia. We have teamed up with one of the world’s biggest charter operators to offer a fun and interesting way to gain your bareboat charter qualifications. 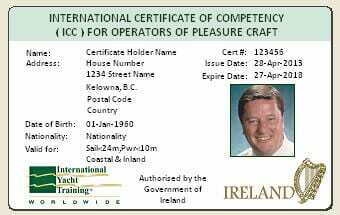 The final award is the higher qualification of INTERNATIONAL BAREBOAT SKIPPER (POWER OR SAIL) with which you automatically qualify for the lower, yet more widely known, “INTERNATIONAL CERTIFICATE of COMPETENCE (ICC). IYT certificates are accepted worldwide and will allow you to charter a boat on your own upon successful completion of the course. The 2-week sailing course is held along the Croatian Coast of Mediterranean, starting at Seget Donji, in the glorious Split region. All the sailing instructors are highly professional and experienced skippers. The boats used for the course are new, comfortable and modern. This specific course is only available for selected dates in April and October, however, if you are only available during another month, please contact us and we will be sure to provide you with information about one of our alternative courses. On successful completion of the course, you will receive an International Bareboat Skipper License (Power or Sail), issued by the International Yacht Training Worldwide Organization (IYT). After obtaining this qualification, you can take the ICC test at the end of the two-week course and only pay the exam fee on spot or in advance. How does a sailing course look in practice? Courses start on Saturday’s. The Crew meet at Seget Donji, where you get board the yachts and get acquainted with the other members of the crew. In the evening, you are free to have dinner out in a restaurant or prepare a meal on the yacht. After that, you can enjoy a walk and maybe buy some souvenirs. On Sunday morning the safety brief and more about the yacht itself: water system, toilet, what may be and may not be done on board, get to know the safety rules, internal space of the boat and your route for the 2 following weeks. You will, then, do the shopping for the provisioning (victualling) as a crew. Having filled in the fridge and ensure there are plenty of drinks aboard enough drinking water, you are ready to embark your sailing adventure. During the two weeks, your instructor will teach you the rules of sailing and everyone will start speaking in the same terminology. Learn something about bearing away on this blog. A typical sailing day starts by calling the hands around 8 am. At 9 you enjoy your breakfast on the deck and prepare for the sailing. Why not rise early and have a walk at the closest coast, swim or a little morning exercise. This will boost your levels of energy and set the mood for a day. You will enjoy up to 2 hours of theory each day with plenty of opportunities to put new knowledge into practice. During the week, each of the crew will have time to practice all the tasks and to try themselves in the role of skipper by giving tasks and orders on their own and managing the crew. At the end of two weeks, after successful completion of the course, you will finally receive your awaited Bareboat Skipper License and a completely new world will be open in front of you. Each of our students will be able to return and receive additional practice or rent a bareboat at a special “Sailing School Student” price with our partners. What language is used during the course? Currently, all the courses are held in English, including the sea terminology. However, there is a possibility to hold the courses in Russian or Croatian, as well, in case a Russian or Croatian-speaking group is formed. In this case, English terminology will be added to the programme. English knowledge is not required for learning the terminology in English. Command of a vessel up to a maximum length of 78 ft /24 metres. In daylight hours and in fair conditions with moderate wind and sea conditions. This certificate is the level of competence that one needs when chartering a boat in the Mediterranean or West Indies where there are restrictions in terms of cruising area and distance from the base and the vessel has to be safely moored in a marina or anchored before dark. The Sailing School provides an opportunity to people of all backgrounds and ages to find out how fun, safe, inspiring and affordable sailing is! The yachts selected for the courses will vary. In general, they will be the newer more popular models from the fleet. The total price excludes your flights and subsistence whilst on board or ashore. Expenses for food do depend on your personal preferences; budget around €25/day. Can I take my family members or friends with me? Yes! There is an option of booking the whole boat for your family or friends, only. In this case, the group will be closed and no one except for your family or friends will participate in the course. The minimum number of people required is 3, as 3 crew members and the skipper is the optimal number to drive the boat. You may also invite your partner to join you on board. She/he is welcome either to support you in your beginnings and enjoy the sea or to be a full-time member of the course. *Full payment in advance is required. What to pack for 2 weeks on board? Flip flops. However, even at warm destinations the open sea can get rough. You can also find our ultimate guide on what to pack for a sailing holiday here. The test for obtaining the IYT Bareboat Skipper Sail is divided into the theoretical and practical part. The theory consists of 50 questions which you have to answer in written form. All the questions are based on the knowledge which you have obtained during the course itself. Each question is valued from 1 to 5. The minimum passing number is 75 in total. How long does the certifcate last? All the IYT Certificates have an expiration date according to the international standards and have to be renewed every 5 years. After you have completed the course, we will ask you to register at the IYT website and you will receive your unique code number. Upon 5 years, you will have to update your personal information on the website and order a new certificate, which will arrive at your home address. The price of certificate renewal may vary slightly. If you need more information about the International Certificate of Competence, the courses or any similar certification, please, fill in your details in the form and we will contact you shortly.